Wonderfully decorative vacationer's map of New England. 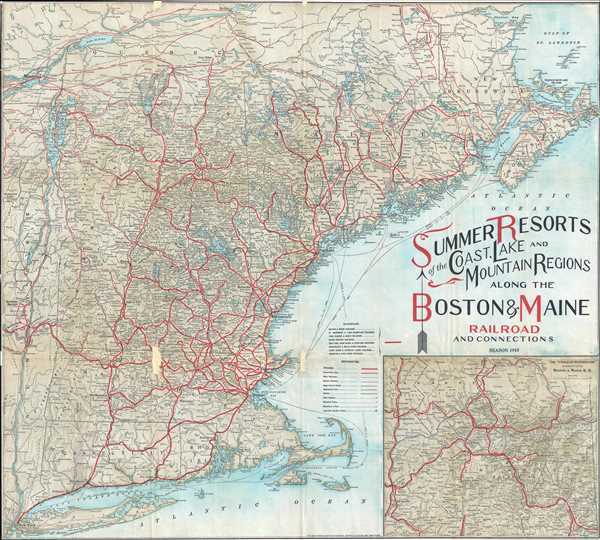 Summer Resorts of the Coast, Lake and Mountain Regions along the Boston & Maine Railroad and Connections. A wonderfully decorative 1915 map of New England issued by the Matthews-Northrup Company. The map covers from New York City northwards along the Atlantic coast as far as New Brunswick and the Gulf of Saint Lawrence; and from the Hudson River Valley to the Atlantic Seaboard. The broad network of the Boston and Maine Railroad is highlighted in bright red. An inset map in the lower right highlights the 'American Switzerland,' or the White Mountains of New Hampshire. Elevation and topography are indicated via shading. This map was issued by the Matthews-Northrup Company for the Boston and Maine Railroad. Good. Backed on archival tissue. Map exhibits some loss in northern Massachusetts and just off Cape Ann.